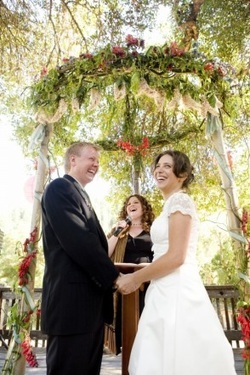 "Planning our ceremony was a process of figuring out what the ritual meant to us as a couple and to our families. We wanted to do something very genuine, borrowing from tradition that we identified with and leaving out anything we didn't. Margot brought in so many great ideas and insights. Her calming presence and obvious respect for our connection led us to pull together all our thoughts to find the perfect balance." Margot is committed to serving people traditionally marginalized from the Jewish community, including unaffiliated Jews, people of color, queer and transgender people, intercultural/interfaith couples and families, secular Jews, and people with disabilities. While her personal practice and primary knowledge-base lies in Judaism, Margot is open to officiating secular/non-denominational rituals, as well as incorporating some practices from other spiritual, religious, and cultural traditions. Margot is based in the Boston area, and is also available to travel. To discuss your next lifecycle event, contact her at 617.499.7944 or at margot@margotmeitner.com. "The ceremony went seamlessly. Margot was able to be both lighthearted and serious - to put us and our friends at ease and help us all to feel power in the moment. She was meticulous and organized, and it was clear that it was just as important to her to create an amazing ceremony as it was to us. We were really nervous and she was a calming presence standing up there with us. She had beautiful things to say about us, about marriage, and about where we had chosen to get married. We both walked away together feeling like there was not one thing we would have done differently that afternoon, which is the best feeling in the world and is a real testament to everything that Margot did to help us work through the emotions, the logistics, and the family dynamics."